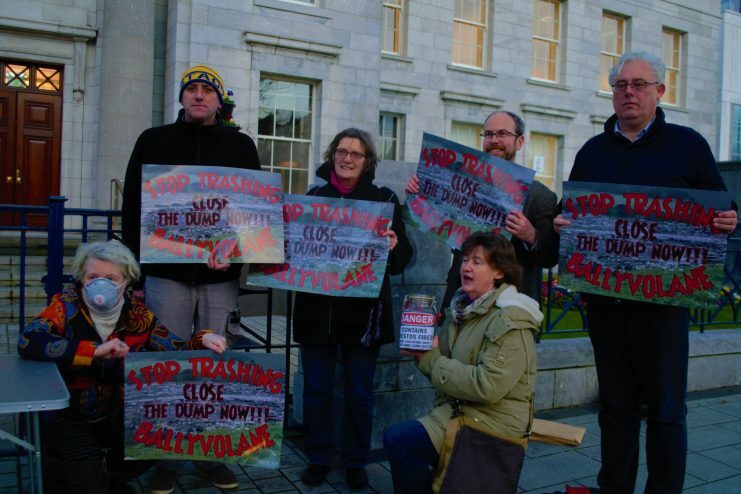 A group of Ballyvolane residents gathered outside Cork City Council today urging authorities to clean up an illegal rubbish dump near their homes. A large volume of household rubbish, including animal carcasses, has accumulated at Ellis’s Yard and its neighbouring Spring Lane on the north side of Cork City for several years. The council carried out a €500,000 large-scale clean-up operation at Ellis’s Yard between 2003 and 2004 yet illegal dumping continued even after the massive operation. This has led to health and environmental concerns raised by both residents and local politicians. Noreen Murphy, one of the residents of Ballyvolane and the organiser of today’s protest, told The Green News that although “the site speaks for itself” residents were still forced to voice their frustration outside the Council. She called on the Environmental Protection Agency to carry out an air quality check for the area, warning that the dumpsite emits dangerous fumes every time it catches fire. Shea Hegney, one of the protestors whose house is next to the site, said that the problem has worsened over the past couple of years. “All year round you have to keep your windows close, it’s embarrassing if you have friends over,” he said. Mr Hegney called on the Council to either “house” the rubbish or “bulldoze the whole area” as soon as possible. “It’s unfair to the residents,” he said. Standing alongside the protesters Sinn Féin Councillor Thomas Gould said that the issue of illegal dumping will persist so long as waste management is left in the hands of private companies. “A few years ago, Cork City Council privatised waste and we’re trying to get the support of all parties to turn back the clock,” he told protestors. Open dumps are known to impose significant risks to human health as well as the environment with air pollution being the primary cause for concern. Particulate matter such arising from open dumps can aggravate humans’ airways, degrade lung function and worsen asthma. Dioxin contamination from burning rubbish is also a significant concern to humans’ health and the environment. Dioxin is a controversial substance most famously used in a toxic defoliant during the Vietnam War and is known to cause ailments as serious as cancer. The council has told residences that it is working on a long-term strategy to solve the issue and that works will be carried out to repair surrounding fencing and to install CCTV to deter future dumping.